This fact sheet was prepared by Grey F. Hayes and Dean W. Taylor under award NA04N0S4200074 from the National Oceanic and Atmospheric Administration (NOAA), U.S. Department of Commerce (DOC). The statements, findings, conclusions, and recommendations are those of the authors and do not necessarily reflect the views of the NOAA or the DOC. 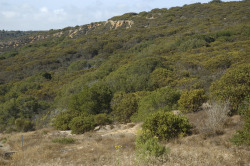 Sandy, inland, late-Pleistocene sand deposits (Arnold series) overtopping leached Aromas Sands Formation parent material on mesas and hillsides of maritime chaparral and along edges of coast live oak (Quercus agrifolia var. agrifolia) woodland, < 350 m.
Erect, shrubs to 3 m tall, basal burl absent; twigs, leaves, nascent inflorescence axis, bract, pedicel, ovary, fruit glandular-hairy; leaves erect, not overlapped, petiole 4–6 mm long, blade 2–3 cm long, 1.5–3 cm wide, blade surfaces similar, dark green to very slightly glaucous, finely papillate, scabrous, dull, glandular-hairy; inflorescence paniculate, 4–10-branched, bracts 3–12 mm, leaf-like, green, persistent; berries 8–12 mm wide, sticky (Parker et al. 2013). February to March (identification possible throughout the year). Fort Ord National Monument, Toro Park (Monterey County). Endemic to the Monterey Bay region of California. The most immediate conservation threats are erosion and fire suppression. The latter interferes with the Monterey manzanita's ability to reproduce, due the fact that the it, like other obligate seeders, requires periodic fires for germination. In contrast, burl-forming manzanitas can resprout after fire. 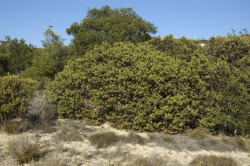 Mowing had reduced regeneration of the manzanita at Parker Flats on Fort Ord—hence the reason for burning the area in 2005. Another threat is competition from invasive species, however twenty years of weed abatement on the Monument have contributed greatly to the health of this and other rare species there. The reported location for San Luis Obispo County requires field study. Parker et al. (2013) do not include San Luis Obispo within the known range. Occurrences in and around the Monterey airport were eliminated in the 1980s. A report from upper Carmel Valley has not been located in recent years. CNPS, Rare Plant Program. 2015. 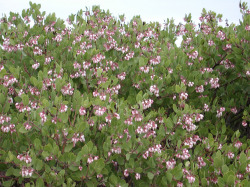 Arctostaphylos montereyensis, in Inventory of Rare and Endangered Plants (online edition, v8-02). California Native Plant Society, Sacramento, CA. http://www.rareplants.cnps.org/detail/104.html [accessed 1 February 2015]. Parker, V. T., M. C. Vasey, and J. E. Keeley. 2013. Arctostaphylos, in Jepson Flora Project (eds.). Jepson eFlora, http://ucjeps.berkeley.edu/cgi-bin/get_IJM.pl?tid=13950 [accessed 1 February 2015]. Van Dyke, E. and K. Holl. 2003. Mapping the Distribution of Maritime Chaparral Species in the Monterey Bay Area. Prepared for the U.S. Fish and Wildlife Service. Lars Pierce (August 2007); Bruce Delgado (August 2007, June 2015).